The Pentium processor was a big departure from all past Intel x86 processors. The Pentium name signaled the end to the 80x86 nomenclature, and was spurred by losing a trademark dispute against AMD. The Pentium processor contained more than one execution unit -- making it superscalar. Intel no longer needed (or wanted) any second-source fabs manufacturing their microprocessors; Intel wanted all of the profits to themselves. The Pentium also added many programming enhancements though Intel tried to keep all of them secret. Intel rapidly diversified the Pentium product line. The original Pentium product ran at 60 and 66 MHz. Shortly thereafter, Intel introduced 90, 100, 120, 133 MHz versions of the popular processor. Intel introduced low-power versions of the Pentium to be used in notebook computer applications. Finally, Intel introduced the MMX-enhanced processors. AMD and Cyrix didn't sit idly by and watch Intel expand and dominate the market. AMD introduced the K5 processor -- their first in-house x86 design. However, the K5 was late to market, and was very slow. In response to their bleak outlook for the K5, AMD bought Nexgen. Nexgen created their own x86-compatible microprocessor, calling it the Nx586. 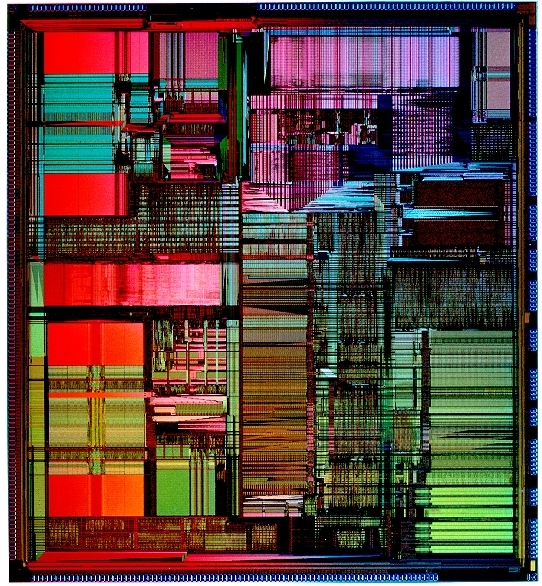 At the time of the acquisition, Nexgen had already finished the design of their next-generation processor core -- the Nx686. AMD used the Nx686 core and created the successful K6 processor. AMD has continued to upgrade this processor to include MMX, and other enhancements. During this time Cyrix introduced the 6x86. The 6x86 was pin-compatible with the Pentium, though the 6x86 nomenclature might lead the consumer to believe that it is a 6th-generation (Pentium Pro) compatible chip. The 6x86 has also been enhanced with MMX instructions as the 6x86 MX. Cyrix has continued to enhance this chip in their attempt to gain more market share. During the Pentium era, a new Intel competitor emerged. Centaur Technologies (a wholly owned subsidiary of IDT) created a fast, cheap, and somewhat low power Pentium compatible chip. Centaur has a low-end (low-cost) market focus. Some industry pundits have called this marketing strategy "bottom-feeding." However, with the emergence and overwhelming popularity of the sub-$1000 PC, Centaur may end up having the last laugh.